Today, we’re happy to announce the release of MongoBooster 1.3. This release significantly improved the UI performance for the MongoDB aggregation operation. 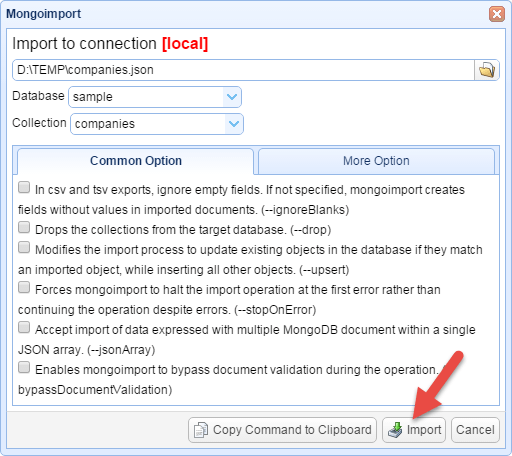 This release also includes UI for Mongoexport and Mongoimport utilities, non-cursor data client-side paging and several minor updates. Although we are showing screenshots of MongoBooster for Windows, all these new features are available for Mac OS X and Linux as well. In the older version of MongoBooster, if I you exec a MongoDB aggregation which will get large number of result, the GUI will just hang or freeze for a while. The 1.3 release addressed the annoying issue, it speeds up the aggregation operation significantly. We strongly recommend you upgrading to version 1.3 to improve the aggregation performance if you ever experienced this. New, client-side paging for non-cursor result data. New, add storageEngine name on tooltip of connection. Improved, handle uncaught exception to avoid crashes. Improved, rearrange connection tree context menu. Fixed, a date to JSON string convert issue. Fixed, the GridFs viewer cannot open file with an unknown file extension. Fixed: a SSL connection issue with “compose.io” SSL enabled mongodb server. Fixed: can not export “aggregate” query result if the “auto-fetch count” feature is enabled. Fixed: can not export query result after canceling “choose fields” dialog.